It’ll be fun seeing what sort of fun cards you end up with. Hopefully, folks will continue the tradition so that, down the road, you get mail that’s unexpected, which makes it even more fun! Awesome, Shep! Can’t wait. Hope you have an awesome trip. Taking the Wee? Yes, the Wee, although when I get there I will wish I had the Street Triple! 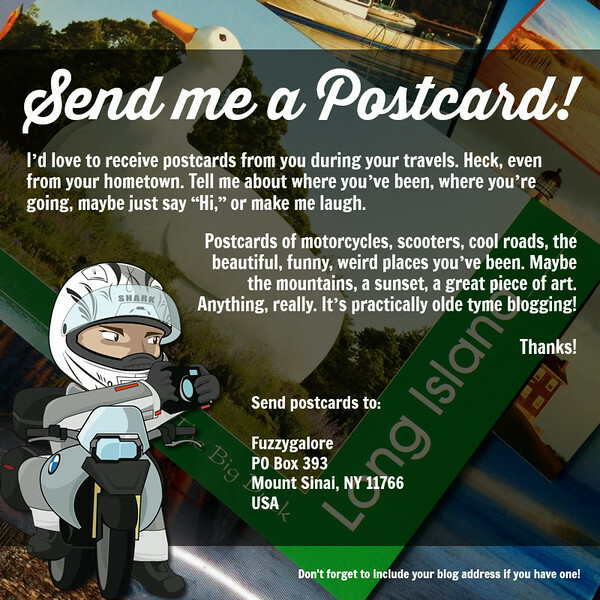 I’m doing a quickie trip to PA in a few weeks and will send a post card. I can’t wait to see what comes my way. The best riding weather is right around the corner. I hope you have an awesome trip. I agree about the weather, Fall is my favorite season!! Hey Fuzzy. Not out traveling but thought I’d send you a card anyway. Couldn’t find anything with a bike on it so had to adapt something. Loving this postcard idea. You don’t need to be doing anything other than wanting to spread a little happiness, John 🙂 I can’t wait to get it!